1 / 22 Cottage is surrounded by an amphitheater of trees. 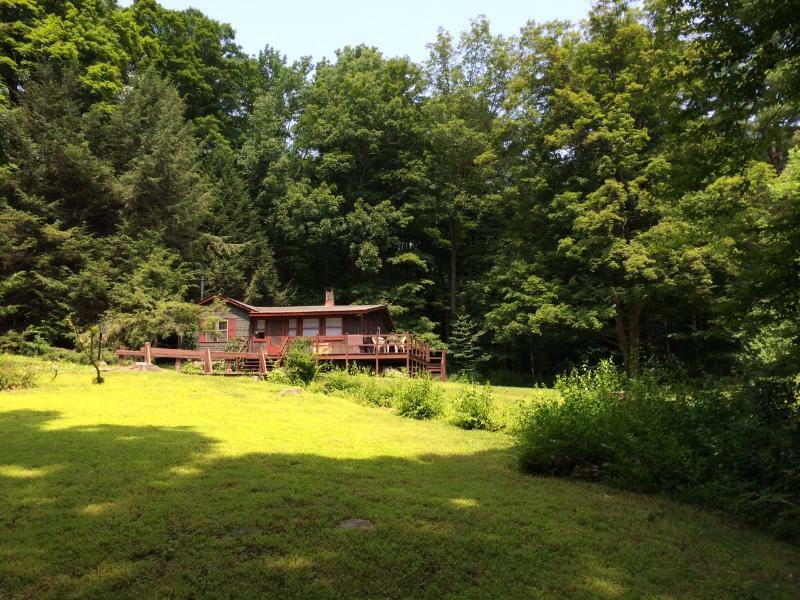 Furnished cottage, with large deck, on 4 acres of woods, with brook and 200 feet Housatonic River frontage. Use of Sharon beach, tennis courts, and children's play area. The brook will dry up during summer dry spells. Located in the beautiful Litchfield Hills, the cottage is 2 minutes from West Cornwall and its covered bridge,10 minutes from the lovely towns of Sharon, Lakeville and Salisbury, the Appalachian Trail, Music Mountain and Limerock Park racetrack, one hour from the Berkshires and Tanglewood, and 2 hours from Manhattan. Outdoor activities include: rafting, canoeing, kayaking and fishing on the Housatonic River; walking, jogging, or biking along Upper River Road which runs three miles alongside the Housatonic River in West Cornwall; walking, jogging or biking on the Harlem Valley Rail Trail; visiting and walking in the Emily Winthrop MilesWildlife Sanctuary, 4 miles away; hiking the Appalachian Trail which passes through West Cornwall; and strolling in the beautiful, interesting local towns of West Cornwall, Sharon, Kent, Salisbury, Lakeville, Amenia and Millerton.. The interior is 900 square feet with two bedrooms, sunroom, living room, kitchen and eat-in cove. Deck is about 50 by 10 feet and wraps around cottage. Clothes washer and dryer in basement. No smoking in cottage. Pets are not allowed. Internet, cable television, and CD player included. Winter activities: The cottage is 10 minutes from the Mohawk Mountain Ski Area - 5 trails, 4 lifts and $30 lift tickets; and 45 minutes from Butternut Basin in Great Barrington, MA, and Catamount Ski Area in Hillsdale, NY. Other nearby winter activity includes: walking along Upper River Road which runs three miles alongside the Housatonic River in West Cornwall; snowshoeing or XC skiing at the Harlem Valley Rail Trail; visiting and walking in the Emily Winthrop MilesWildlife Sanctuary, 4 miles away; hiking the Appalachian Trail which passes through West Cornwall; and horse-drawn sleigh rides through the New England countryside at Loon Meadow Farm in Norfolk. Sorry, pets are not allowed and no smoking inside the Cottage. The Neighborhood Located in the beautiful Litchfield Hills, the cottage is surrounded by lovely countryside and quaint and welcoming New England villages. It is 2 minutes from West Cornwall and its covered bridge, and less than 10 minutes from the Appalachian Trail, Mohawk Mountain Ski Area, Music Mountain, The Lime Rock Park, Road Racing Center of the East, Clarke Outdoors for kayaking, canoeing, and rafting on the Housatonic, and the Housatonic Meadows State Park for fishing, boating and swimming. It is 15 minutes from Lakeville and Lake Wononscopomuc, one of Connecticut's premier deep water lakes with swimming and boating, Lakeville is also home to The Hotchkiss and Salisbury Schools, many fine restaurants, multiple art galleries, and the Scoville Memorial Library, the oldest publicly funded library in the country. It is 20 minutes from the famous Sharon Green and Sharon's beach, tennis courts, and children's play area, and from Millerton, NY with its movie theater, art galleries, bookstore, an old fashioned diner, and the Rail Trail for walking, jogging and biking. Renters at the Cottage have a special beach pass that gives them access to the Sharon beach. A 35 minute drive takes you to Great Barrington , MA for even more shops, restaurants and movie theater. It is 55 minutes from Tanglewood Music, and 25 minutes from Norfolk's Infinity Music Hall; or to you to Millerton, NY with a movie theater, art galleries, bookstore, an old fashioned diner (with updated menu) and the Rail Trail for walking and biking. For skiing, it is 10 minutes from Mohawk Mountain Ski Area, 38 minutes from Catamount Ski Area and SkiButternut. There are the US Eastern Ski Jumping Championships in nearby Salisbury every February. It is one hour from the Berkshires and Tanglewood, and 2 hours from Manhattan. Grocery Stores When coming from the south on Route 7, there is the IGA Supermarket in Kent (about 20 minutes from the cottage). About 5 miles before the cottage on Route 7 at Cornwall Bridge, there is a Country Market delicatessen, coffee shop, and small grocery. When at the cottage, the closest supermarket stores are the Sharon Farm Market (about 15 minutes away) in Sharon's small, and only, shopping center; and LaBonne's Market at 22 Academy St, Salisbury (about 15 minutes away). Both are excellent. Restaurants nearby In West Cornwall there is the Wandering Moose Café, open for the three meals – friendly, good food, and good prices. In the summer there is a special French restaurant open for dinner, RSVP Restaurant, with a set menu for all and the same price, around $100. You bring your own wine. In Lakeville, 10 minutes to the northwest, there is a coffee shop, pizza place and a number of good restaurants. Kent, of course, has a number of very good restaurants.